Hammer drills are heavy-duty tools for solid surfaces. They allow you to drill into concrete, bricks, and stone fixtures, so they have to be strong and durable. You may be asking yourself: “how do I choose the best hammer drill?” That’s where we come in! We’ve compiled this list of the best to make the choice a little bit easier. Here are some things you should know before we get started with our list. Power: This refers to the voltage coming straight from the battery. This is often a measure of the strength of the drill because the higher the voltage, the more punch you get out of the drill. Pieces: This is the number of pieces you get in the purchase, including the drill. This will encompass any accessories, bits, and even the case. We’ll also tell you what comes with it in the description! 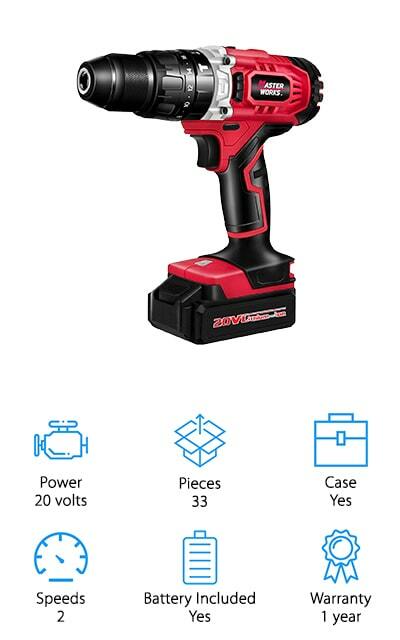 Case: When a cordless hammer drill comes with a case, it gives you a way to carry your tools with you and keep all of your batteries, chargers, and bits in one place. It’s a convenient perk. Speeds: Different speeds will help your hammer drill accomplish different tasks. The same speed won’t necessarily work for drilling into all your different surfaces, so multiple speeds will allow you to complete a multitude of different tasks. Battery Included: Does it come with a battery? Some of the drills on our list come as the bare tool, usually as part of a line of tools that can all share the same universally rechargeable batteries. Warranty: A warranty is a company’s guarantee that their product will work. If it breaks or doesn’t work correctly within the time frame, you can get a refund or a replacement. The company stands behind their product! Let’s get into our best cordless hammer drill reviews! We’ve done all of the research in order to bring you only the best products. By looking at the information above, you can make an informed decision about what you want in a hammer drill. Our top pick and budget pick are our favorites, so check those out before continuing through the rest of our list. You’re going to love these tools! First up on our list is the best DEWALT cordless hammer drill we could find. DEWALT is a well-renowned company that produces a variety of high-quality tools. 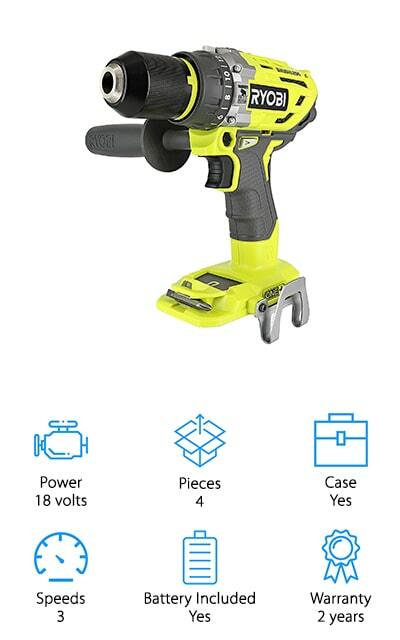 This hammer drill also comes with an impact driver to make sure that you’re always using the right tool for the job. Both come with 20-volt lithium batteries that will keep your tool going through the whole job. The hammer drill has three speeds to quickly drill into masonry, bricks, and stone, and there are three LED lights right on the front so you can see right where you need to drill even the dark or compact spaces. It comes with a case and the charger for both of the batteries and tools. 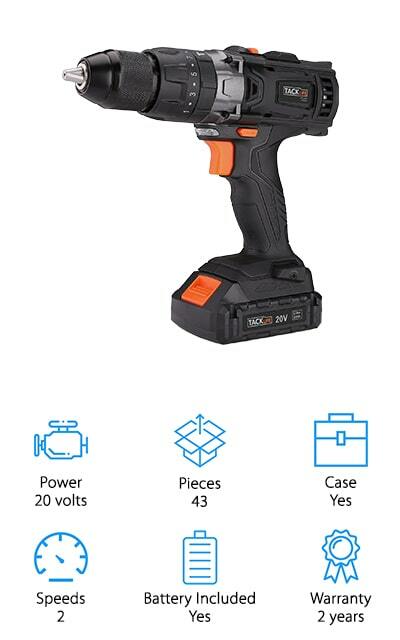 They are compact and use the battery power wisely so that you get the most runtime and power out of your tools before you have to charge them again. These are great, durable tools with a 3-year warranty! Tacklife makes the best value cordless hammer drill on our list. 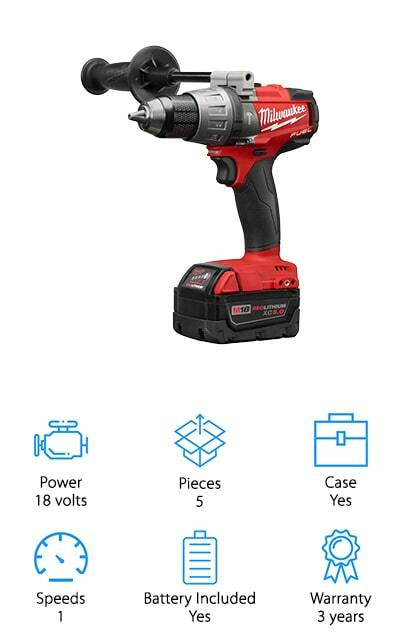 It’s amazing that a drill with a 20-volt battery comes at such an affordable price! 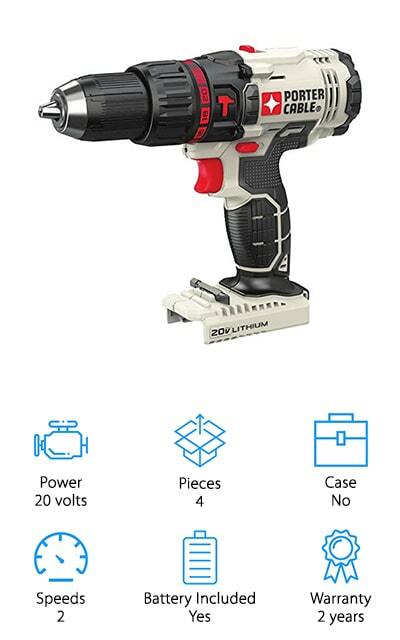 This tool uses power efficiently so that the included battery will last a long time. A one-hour charge will keep it ready for whenever you need it. There are 15 torque settings and 3 different positions you can use this hammer in, as well as a two-speed design for both accurate and precision drilling. Maximum torque setting is about 310 pounds, perfect for driving into those solid surfaces. It also comes with a 13mm self-locking spindle. In total, this value drill comes with 43 different accessories for you to use with your drill, including driver bits, drill bits, and holders. Our favorite part is the built-in LED light on the front of the drill that allows you to see in dark or tight spaces. This set includes a case to keep it organized. Milwaukee delivers with the M18 FUEL drill, coming in at a powerful 18 volts. The brushless motor allows you to deliver 1,200 inches of torque per pound and up to 2,000 rotations per minute, increasing your drilling speed even when you’re drilling into something solid and dense. 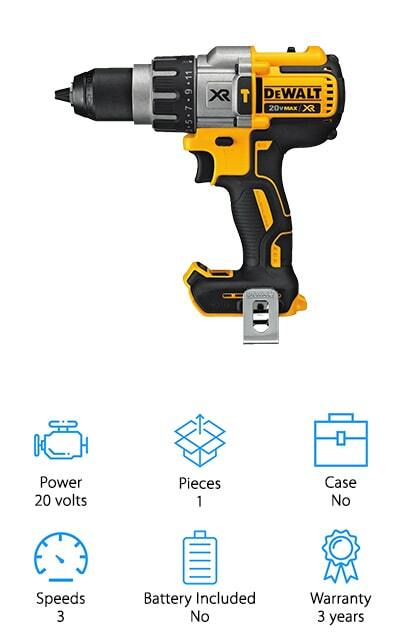 It’s a compact drill as well, which is a perk when you need to travel with it. It comes with the case and the batter, as well as a driver in addition to the drill. These tools are lightweight and include a form of monitoring that protects them from overheating or overworking. You can’t get much better than a drill that babysits itself. The battery pack is astounding, allowing you more drilling time per full charge than some of the other drills on the market right now. Hold onto your drill bits, because you won’t want to put this drill or driver down. You are going to love it. Porter-Cable makes the best cordless hammer drill in its class. It runs a full 20 volts and can reach up to 1,500 rotations per minute on its highest speed. There are two speeds available, allowing you to customize the way the drill works for the maximum usage capabilities. 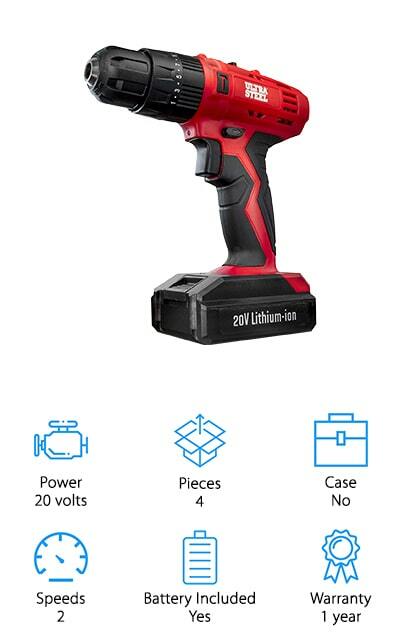 This is just one tool, but it comes with two different batteries so you can charge a battery while you’re working and quickly switch between them when the first one dies. Still, the battery will last a long time compared to some of the others on our list. The ½-inch chuck keeps the bits right where you want them to be. This hammer drill is compact and lightweight, easy to maneuver and use no matter what type of job you need to do. When you need to drill right into masonry and stone, go with this versatile drill from Porter-Cable. You definitely are not going to regret it. 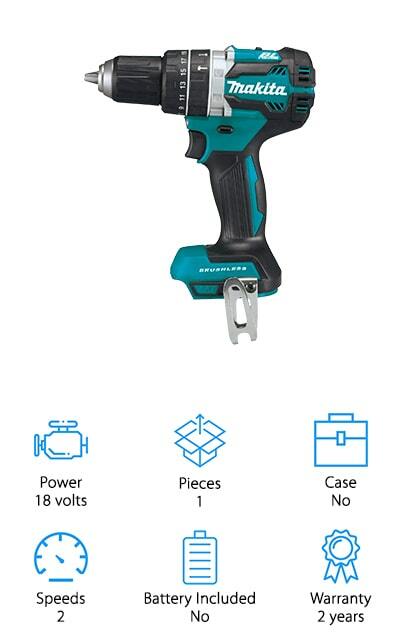 The best Makita cordless hammer drill that we found in their collection is this driver-drill combo tool. It contains a brushless motor that can help you deliver about 530-pounds of torque per inch. Plus, you can use it for up to 50% longer with the advanced electronic power control. The motor is 18 volts to provide you with consistent power that will help you in any application. There are two speeds on the motors so that you can do all of your drilling, driving, and hammering without changing tools. What’s great about this tool is the battery, which is not included in this package. If you have other Makita tools, you can save time and money by exchanging batteries between them. These universal Makita batteries have fast charge times and long life for maximum efficiency in your work. Plus, it only weighs 4.2 pounds with the battery, so you can work for longer without fatigue. DEWALT is back on our list again with the best cordless SDS hammer drill. This tool is pretty amazing, with three speeds for different applications so you can get all that you need without switching tools. 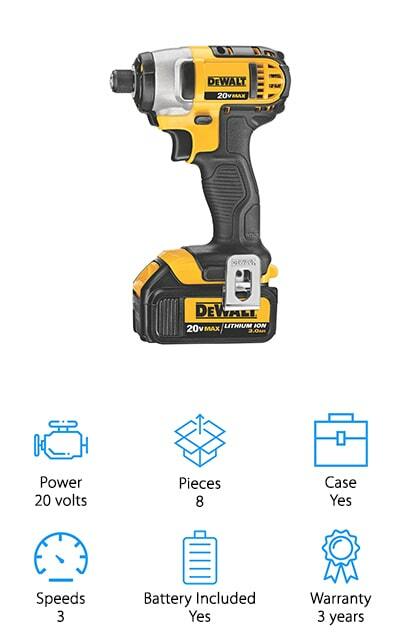 The battery and charger are sold separately, so if you already have DEWALT batteries and chargers you can definitely use them in this tool to save some money. At max speed, this tool puts out about 2,250 rotations per minute, which is 82% more powerful than lower speeds. Plus, the inclusion of a brushless motor means that the battery is going to last a lot longer on a full charge. It comes with an LED light on the front of the tool that has three different settings as well as a spotlight mode so that you can always see what you’re doing no matter how tight or dark the spaces are. The handles are comfortable and the metal ratcheting chucks are super durable. This hammer drill by Ryobi has a 24-position clutch with a torque of about 750-inch pounds, allowing you to use it for all different applications, including plastic and masonry. The base of the hammer has a magnetic bit holder attachment so you don’t have to keep going back to your tool bag to get the perfect attachments. The included battery is one of the company’s largest, with a gauge to tell you how much power remains. It can also function in lower temperatures, unlike some other batteries. All of the pieces in this set come with a contractor’s bag that perfectly fits the drill, battery, and charger. The three different speeds allow you to drill, drive, and hammer drill for even the toughest of jobs. There is even a space for a side handle to give you better precision when you’re using the hammer-drilling feature. The molding over the pistol grip makes it comfortable to use! This drill driver set comes with a total of 19 different pieces so that you can get the most out of your purchase. There are two speeds on this drill, including a drill function and a hammer function separately, as well as a 15 piece accessory set that comes with 12 different drill bits of varying sizes and applications. It comes with a powerful 20-volt Lithium battery that will also fit into the other VonHaus tools in the series. This set includes an LED work light so you can see in darker conditions, and a forward-reverse button near the operation trigger so you can operate it one-handed. It’s a lightweight tool made of cast aluminum, and the effortless handling and durable construction make this one of the best cordless hammer drills for concrete. The motor is a high-performance model with 336-inch pounds of torque and a variable speed trigger that cycles easily between 440 and 1650 RPM. ULTRA STEEL makes this hammer drill driver set that comes with a keyless chuck so you can easily change between bits. 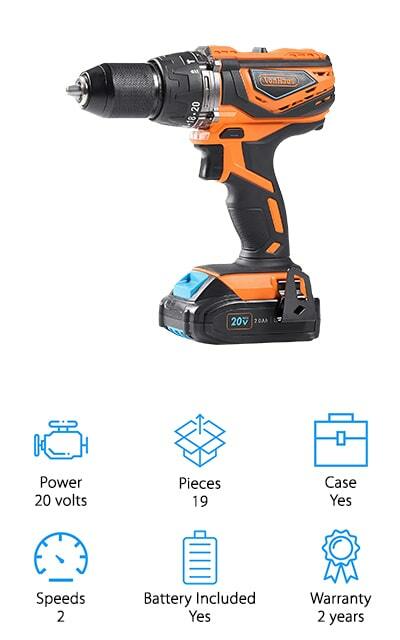 It comes with a variable speed trigger to switch between the two speeds or modes, and even has an electric brake that will stop the tool to prevent damage to whatever you’re working on. It has an integrated LED light so that you can see in tight spaces, and comes with a 20-volt battery. The entire tool is lightweight and great for home improvement projects as well as professional work – you can drill into wood, metals, plastics, stone, brick, and even concrete materials. The precision torque settings allow you to change speeds for the type of material that you’re using for the best results. It also helps to prevent stripped screws. Plus, you can use them for a long while because of the soft ergonomic handles that help to reduce hand fatigue during extended drilling sessions. Masterworks makes one of the best cordless rotary hammer drills on the market right now. There are 20 different positions on the clutch and two different speeds so you can get the best torque rating for the job, no matter what material you’re drilling into. The charger can get the 20-volt lithium battery up to a full charge in about an hour, saving you time. Plus, it includes a rubber-covered handle for comfort, one-handed use, and an LED light to illuminate darker places. It comes with 25 accessories, including 10 drilling bits, 10 driver bits, 3 masonry bits, and even a tool bag for keeping everything together. This really is a great set that gives you everything you need to get started with your home DIY projects as well as professional use. It’s a powerful, lightweight machine with an amazing value, as it comes with stuff that you would usually have to purchase separately. We love it!